Say hello to your new favorite (naturally sweetened, incredibly rich, salty-sweet) dessert. Chocolate Peanut Butter Freezer Fudge made with just 4 ingredients, in 30 minutes, and 1 bowl (food processor)! Shall we? This recipe was inspired by simplicity. 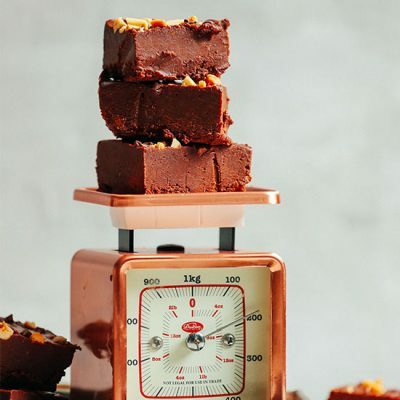 I’ve made fudge I adore in the past, but some people tend to have trouble with their food processors being able to make coconut butter – a central ingredient in that recipe. So I wanted to come up with a variation that would be a little easier to tackle. And thus, freezer fudge was born! This recipe is made entirely in the food processor. First, dates are processed until a paste or ball forms. Then peanut butter is blended in. Next comes cacao powder for that rich, chocolaty flavor. And lastly, coconut oil makes everything creamy and smooth. Just look at that dreamy goodness. I could hardly keep my spoon out of the bowl! Simply transfer to a parchment-lined dish, freeze, slice into squares, and you’re golden. Share this fudge with everyone – friends, family, neighbors. They won’t believe that it’s made with simple ingredients and naturally sweetened! It’s kind of incredible! 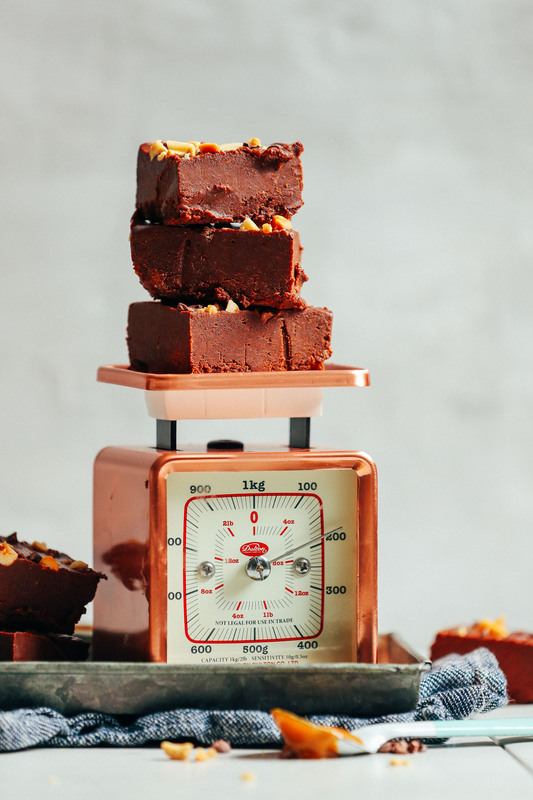 Keep this fudge on hand for a healthier treat to indulge in throughout the week. Or make a batch to bring to dinners, gatherings, or parties. We can almost guarantee that it will be the most popular dessert on the table. If you’re into chocolate-peanut buttery things, check out our Peanut Butter Cup Cookies, Peanut Butter Chocolate Chip Granola, White Chocolate Peanut Butter Eggs, Peanut Butter M&Ms, Chocolate Peanut Butter Banana Shake, and Double Peanut Butter Chocolate Chip Cookies. If you try this recipe, leave a comment, rate it, and tag a photo #minimalistbaker on Instagram. Cheers, friends! Incredibly rich vegan fudge made with 4 ingredients: peanut butter, cacao powder, dates, and coconut oil. 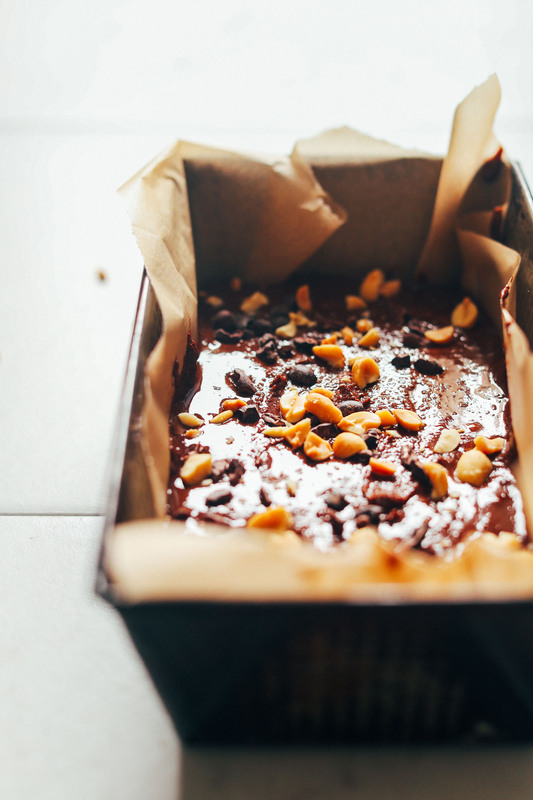 Naturally sweet, fudgy, intensely satisfying, and so delicious! The perfect healthier dessert. 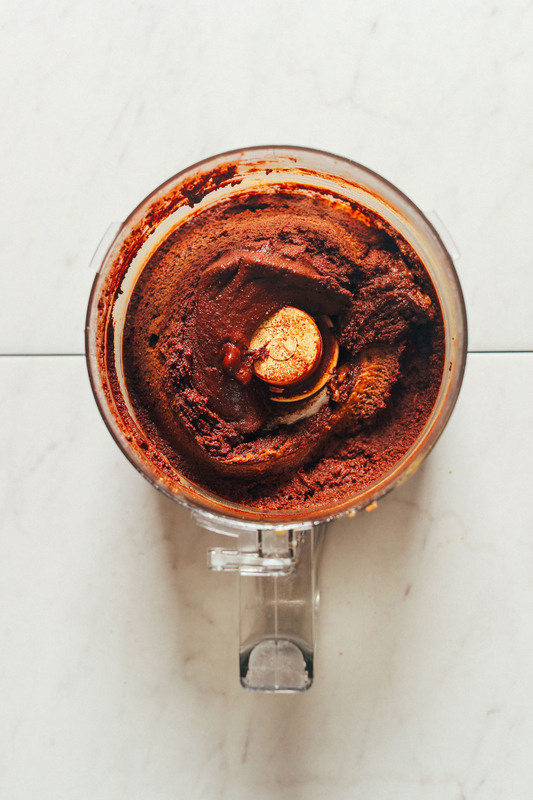 To a food processor, add pitted dates and mix until a fine paste or a small ball forms. Remove lid and add peanut butter. Blend once more to combine. Add cacao powder and blend once more to combine. Add melted coconut oil, starting with the smaller measurement and working your way up as needed until a fudgy paste is formed. It's OK if it looks a little clumpy at this point (see photo). You mostly just want to make sure it's not dry, so add more oil as needed. (You shouldn't need more than the recommended amount of coconut oil.) If it's clumpy or a tad grainy, that's OK. You can smooth it out in the next step. Transfer to a parchment-lined loaf (or 8x8-inch) pan and spread with the back of a spoon until a smooth, even surface is achieved. Top with roasted salted peanuts and/or cacao nibs for texture (optional). Transfer to freezer and freeze until firm to the touch - about 20 minutes or more as needed. Then remove from freezer and slice into desired squares. If it has trouble slicing, let thaw for a few more minutes and/or run your knife under hot water to ease cutting. Enjoy! Store leftovers covered in the refrigerator up to 1 week, or in the freezer up to 1 month. This fudge does best when kept refrigerated. If it sits out for too long in a warm environment, it can soften. *1 cup packed dates is usually about 20 good-sized medjool dates. *The type of peanut butter that works best in this recipe is one made with two ingredients: peanuts and salt. Other additives and sweeteners can make the fudge too thick or gummy. Our favorite brand at the moment is Wild Friends (not sponsored, just love the brand). *Nutrition information is a rough estimate for 1 square calculated with the lowest amount of oil (which, as the recipe is written, is 1/4 cup or 60 ml). So yummy! Perfect texture. Love that it’s all date sweetened. Perfect after-dinner treat!! Lasted in my freezer for about 30 minutes before half was gone. I’m sure my boys and I will demolish the rest within 24 hours, fighting over the last piece. Still can’t believe it’s only 4 ingredients! Love your recipes, thanks for all of your hard work! Do I sub the coconut oil for coconut butter instead if I wanted to use that instead of the oil? Thanks! I’m not sure that would work! Hiya – this looks great. I only have a Nutri-Ninja and a comment suggesed that it may have problems processing the dates. I have pure date syrup, do you think this would work? Maybe starting with half a cup and add more if necessary?? Another 5 star! Love the minimalism. So good. Delicious – I have made this 3 times already and will make it many more times – I keep the box in the freezer and just take a small piece whenever I get a craving for something sweet! I made this with carob instead of cacao. It’s very yummy! And while licking our fingers clean, we thought it might be an excellent bread-spread as well! Its easy to make and would be much healthier than store bought chocolate spreads. Great recipe!! Flavor out of this world. I feel like I need an award for following directions. Thanks so much for sharing. Your blog literally feeds me. Yay! We are glad to hear that! made these for a vegan brunch and they were an absolute success! Made it! Fabulous! Taste just like fudge made with powdered sugar! Yay! Glad to hear that, Kristine! My fudge came out tasting very peanut butter and not so much chocolate, essentially like eating spoonfuls of pb. Could it be the brand of cocoa?? I sooo wanted this to be a healthy alternative! Did you change the recipe in any way? What brand of cocoa did you use? Let us know and we’ll do our best to help you out! I followed the recipe precisely and used Fry’s Premium cocoa. Wow! I need this in my VitaMix, super easy & oooh so delicious!!! I took it to a party and everyone there asked for the recipe. I used cashew butter for the lower sugar content and I think it has a little less fat. I also used carob powder and carob nibs. Excellent healthy dessert that my son & all his friends also loved (ages 12-14). I just made this today and it is delicious! I added pecans instead of peanuts to the top. Yum yum! This recipe sounds amazing! My house mate who’s vegan like me has a severe coconut allergy, is there anything we can use instead? Hi Autumn! I’d recommend leaving the coconut oil out entirely and add more peanut butter (the natural liquidy kind) – hopefully that helps! I’m not sure if it will work, but you can give it a try! I also wonder if a little water would work but am not sure. Let us know! yummy – perfect for our coeliac household – used crushed walnuts for the topping – thank you for another easy treat!! Glad to hear you enjoyed it, JP! I tried the recipe yesterday and I have only one “word”: OMG!!! I used 1/2 cup of coconut oil + a tiny amount of water as the blend was a bit too grainy/textured – my mistake, I went too fast with the dates processing… As a result, some of the oil separated when I placed the fudge in the tray to freeze, which I turned to my advantage by sprinkling raw cacao nibs and shredded coconut to soak it! I also added some vanilla extract, cayenne, and 2 Tsp of maca powder. Thank you for this delicious recipe! I made it last night and loved it. I have quite the sweet tooth and I’m always looking for healthier versions of my favorite sweets. In this busy schedule, something that can be prepared under 30 mins and is healthy are very few. You’ve given one of the best recipe. thanks for sharing the dish. Whoop! We are glad you enjoyed it, Stella! My husband LOVES fudge, I can’t wait to try this out in him! I love finding hidden healthy recipes! Yay! Glad to hear it, Elizabeth! Delicious treat and a hit with my picky toddlers! Thank you!! I’m really happy with the recipes and have made a few. My problem is that my son has nut allergy…. 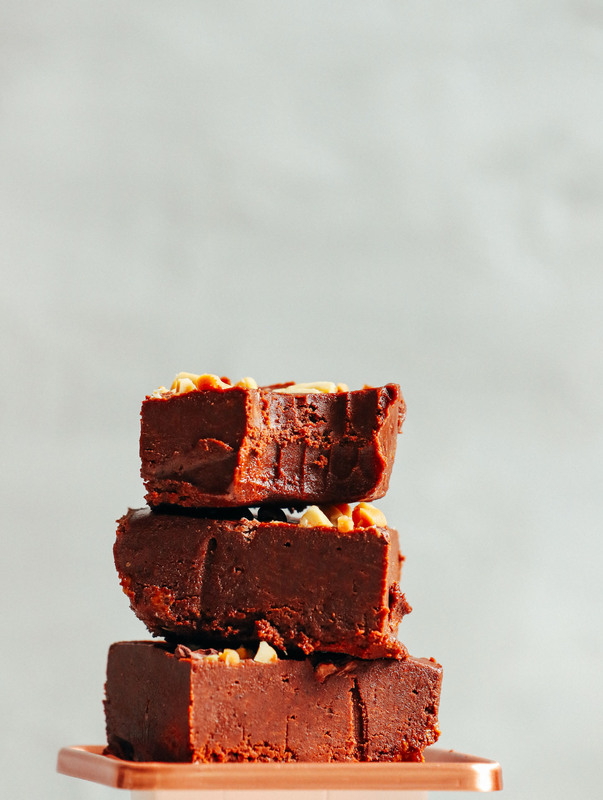 Is it possible to give me some alternative recipes for sweets like the Chocolate Peanut Butter Freeze Fudge, please. Hi Claudia! Have a browse through some of our other dessert recipes and there are others you may be interested in, like these Chocolate Coconut Butter Cups! I followed the recipe exactly and it turned out perfectly. Although, I did use a larger pan, I am glad the fudge was thinner- easier to indulge in! Whoop! Glad you enjoyed it, May! This is my first dessert recipe from Minimalist Baker and it was a success!! This mixed up pretty well in my small Cuisinart, although next time I may half the recipe for less processing time. Whoop! Glad to hear it, Becky! I Made this with the maximum amount of coconut oil and it was stil to thick ( it tasted good but my husband thinks its to dry?) i made it with peanutbutter from only peanuts and added Some salt. I used RAW cacao powder and medjoul dates. How can i make it more fudge like? Add more coconut oil? Next time want to make it with pistachio butter. I would say add a “little” more coconut oil for a fudgier texture! Followed recipe to a T in a food pro—so easy. Brought these to two BBQs last weekend and they were a hit. Wish I’d held back a couple more for us! ? Would def make again. Not at this time, sorry! Let us know if you experiment with this recipe! What do you think about making it in a Vitamix? Sounds amazing – can’t wait to try it! Hi Randee! I think that should work. Sometimes they have a hard time processing dates, so just watch out there! So good! Not identical to traditional fudge but definitely would satisfy a fudge craving. Tastes very chocolately and peanut buttery, hardly any coconut flavor. Definitely will make again. I made the recipe as written (although I did use cocoa powder instead of cacao powder). My food processor is out of commission but I successfully used a Ninja blender–I think it takes more processing time and extra scraping but it got the job done. I have the sharp blades on the blender (not the serrated ones) which I think helps. My lender blew up in the process of this. I use crunchy peanut butter which I think was too dry with the dates. I proceeded by hand however and it was delicious! Oh no! Glad you were still able to enjoy this, Kristin! Great recipe – thanks Dana! Made this with half peanut butter and half almond butter, and used Deglet noor dates instead of Medjool dates – was delicious! Not too sweet and freezer friendly. This was such a delicious, fun, easy, quick recipe to make Friday night pre-movie time. I soaked the dates in warm water for 20-30 minutes. Then blended everything up in the Vitamix blender. Worked really well! Added a dash of vanilla, just cause I’m on a kick. Thanks Dana for all the delicious recipes over the years! My friends, family, and favorite cashiers all know about my ongoing Minimalist Baker crush. I made this delicious fudge and have a question about how it turned out. The consistency ended up a little crumbly, like brownie bites rather than creamy fudge. I made some substitutions, which of these do you think could be responsible? Or should I have added more coconut oil? Hmm, those substitutions shouldn’t have affected the texture. Were your dates moist and fresh? Maybe a little more coconut oil would’ve helped with a silkier texture! Hi Dana. Totally love your site. I’ll be making this fudge tomorrow. We hope you love it, Andy! Oh totally! As long as the ingredients are just salt and peanuts OR just peanuts. Add salt to taste, starting with 1/4 tsp. Hi! Do you think crunchy PB will work? I love that this is all REAL food!!! Thanks for another great recipe! Yep! Crunchy would be awesome. I would love to make this! But I don’t think I have any dates. Any idea if it would work with maple syrup? I think so, but we haven’t tried. If you do, let us know! Very delicious! Will add to Christmas arsenal of desserts! Thank you for.a great recipe! Made this today…it’s AMAZING!! :) Love how it’s freezer-friendly too. Made as directed and turned out perfect! Delicious and would be incredible served with some vegan vanilla ice cream. Ooh, sounds amazing! thanks for sharing! Because this sounded so scrumptious but I didn’t have quite the right ingredients on hand, I made a bastardized version with dried-out deglet noors (with a bit of water) and chunky PB, and it was still awesome. I have little restraint with this kind of deliciousness (and I am *so* not sharing with my wheat- and dairy-eating husband), so I made the fudge into little mounds and wrapped them individually in parchment paper before freezing in an airtight container. To the reader who wanted to know if water would sub for oil: Since I had to rehydrate my old dates and I’m not a huge fan of coconut, I did try a couple of mounds without the oil. The result is not nearly as rich and luscious but is still quite yummy. Oh, and for anyone else on the fence about coconut: I used the bare minimum, and out of the freezer the coconut flavor is very mild and extremely well integrated. Thanks for another amazing (and deceptively simple) recipe, Dana! 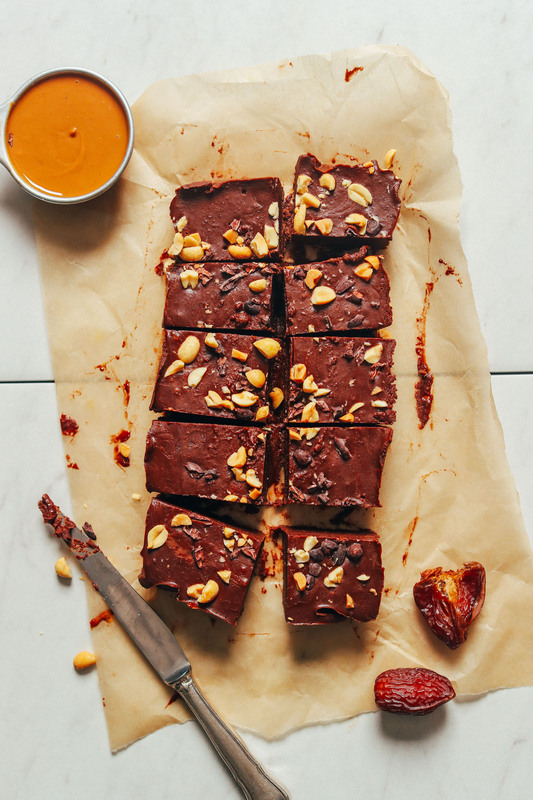 I just made a peanut-free version of this with 1/2 cup almond butter and 1/2 cup tahini instead of the PB and cashews instead of the peanuts and it is SO good! Thanks so much for the inspiration!! Yum! Thanks for sharing your changes, Cath! I have made these twice this week (I’m addicted) and am curious to try a peanut-free version. Yours sounds great, Cath! This sounds fantastic Dana! I’m allergic to coconut though. What would you recommend as a replacement? Hi Julia! I’d recommend leaving it out entirely and add more peanut butter (the natural liquidy kind) – hopefully that helps! I’m not sure if it will work, but you can give it a try! I also wonder if a little water would work but am not sure. Let us know! Ahhh this was so yummy and couldn’t have come across my feed at a better time! We are currently awaiting a new oven and we had company tonight. I had all of the ingredients and they were the perfect sweet treat after dinner. Huge hit. Thank you!! Yay! thanks for sharing, Kristina! This was delicious. I made it for my husband, who is on the SCD diet, and I would pick this dessert over a regular one I could have. So good and very rich. 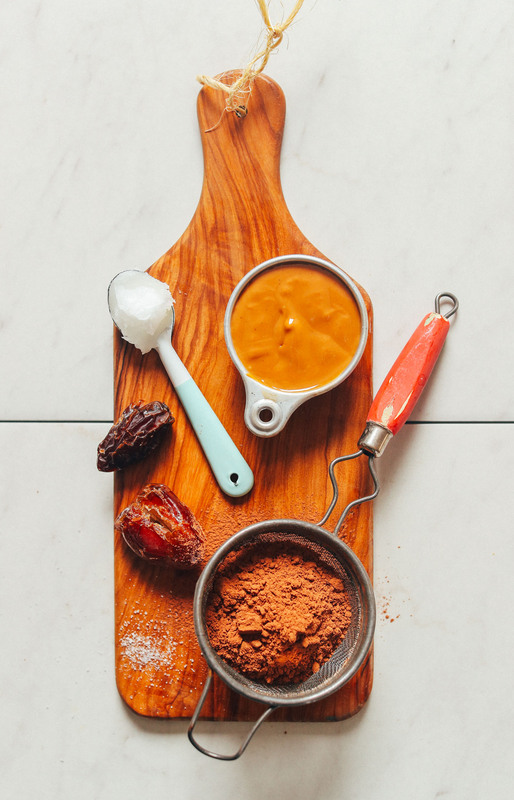 Doesn’t taste as “date-y” as some date desserts can. THis was the perfect easy desert to take to a party I’m going to this weekend, thank you so much for another easy and delicious recipe! Is there a good coconut oil substitute? even if it’s not vegan..? What about just more nut butter? Coconut oil is not good for you??? Seriously? You better go back and and study endocrinology a little bit more. Medium and short chain triglyceride molecules are amazing for your body. Sounds amazing Dana! Any reason almond butter wouldn’t work instead of the peanuts? I also would like to know how to make this without oils if at all possible, thank you. You could try subbing ALL nut butter? Hi! I love your recipes! Any chance you think I could sub honey for the dates? Would you advise using less coconut oil in that case? I can’t tolerate dates right now. Thanks! Hmm, Not sure! Let us know if you give it a try! OMG these look amazing!! Definitely going to try them. Do you think using a sugar alternative like erythritol instead of dates would work? Would I need to change the ratio of the other ingredients? Hmm, not sure! I haven’t tried it that way as dates make up a large portion of the ingredients. Let us know if you experiment! Made the No-Bake Peanut Butter Cookies this week! Excellent! 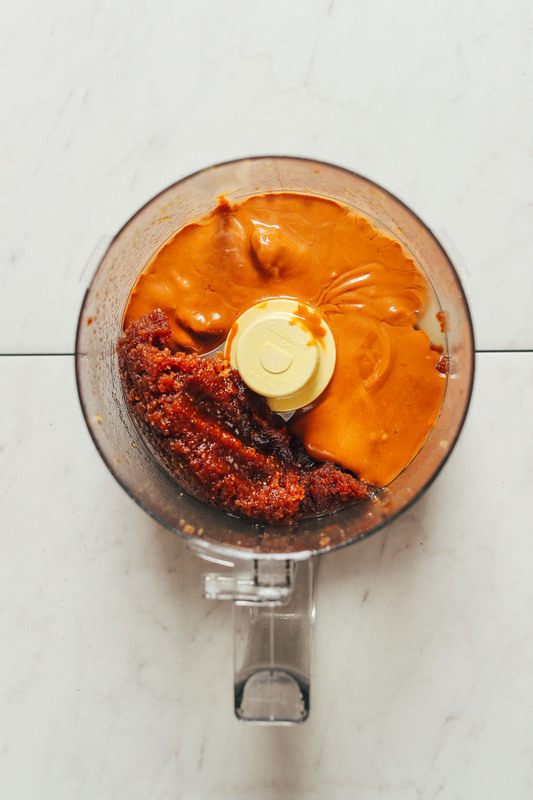 However, I’m going to tweak the recipe next time – less cocoa powder, and I had a hard time getting the dates to mix with the peanut butter – came out chunky, not smooth. As well, the oats didn’t get very fine, even though I have a Kitchen Aid food processor. I’m going to try oat flour next time. Oats? There are no oats in this recipe! :) Perhaps you meant to comment on another recipe? I made using my Vitamix with success. Absolutely delicious but high is fat and sugar ? Thanks for sharing the Vitamix! This is definitely a dense treat – only little bits needed to satisfy. Hope you enjoy it! Can I do this in a Vitamix? I have a dry container as well. Hi Dana! could I substitute the cacao powder with carob powder? Hi Dana! I’m going to make this for a game night with friends next week but I wonder if it will end up melting all over by the end of the night since it’s freezer fudge. Will it hold up sitting out for a few hours? In my experience, setting it out for about 1 hour in a warm room can tend to start softening. But, the more oil you add the more melty it becomes at room temperature, so maybe reduce it a little if you can! I don’t have a food processor can I use my Ninja blender? I think so. Sometimes Ninjas can have a hard time processing difficult ingredients like dates. But let us know how it goes! This looks amazing! 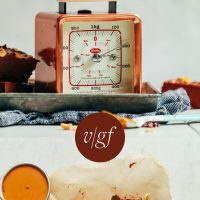 Do you think I could use my vitamix instead of a food processor? I think so. Sometimes they have a hard time processing dates, so just watch out there! Hi! Big fan of yours! I have 4kg of deglet nour dates to use. Would they work for that recipie? Looks so delicious and so easy to make! I love chocolate and peanut butter together! Omg Dana! I’m going to weigh 800# by the end of my pregnancy with all these chocolate and peanut butter treats lately! You’re on a roll! Love it! Can’t wait to make this one!! lol, hope you love it, Elise! Oh my Mom used to make a fudge with butter, confectioner’s sugar, peanut butter, and cocoa. I loved it, but it has soooo much sugar! I think this might taste similar, can’t wait to try it for a trip down memory lane for me! (updated to be healthier….). When I make it, I’ll come back and rate it. Thanks! Please do! Hope you love it, Anne! Hi! Can I sub coconut oil with water to have an oil-free recipe ? Ps: I love your blog and youtube channel ❤ so useful and so good ! Hi Melody! I’d say leave it out entirely and add more peanut butter (the natural liquidy kind) – hopefully that helps! I’m not sure if it will work, but you can give it a try! I also wonder if a little water would work but am not sure. Let us know!